One fateful night, when young Jack takes the beautiful Nara for a walk in the woods, his love is kidnapped by the villainous orc Korg. Forced to mount a rescue, Jack plunges into Korg’s underground base, where he happens upon a strange blade that becomes an unlikely ally. In JackQuest, players will explore the cavernous depths of Korg’s slime-ridden, labyrinthine lair. There, they will solve environmental puzzles, discover power-ups, obtain new abilities, collect weapons, and challenge subterranean foes, including massive bosses. A fast-paced affair, JackQuest wastes no time with its quick combat and steady progression, guiding players through a single-interconnected world full of secrets, collectable gems, and hidden challenges that are sure to keep completionists engaged for hours on end. 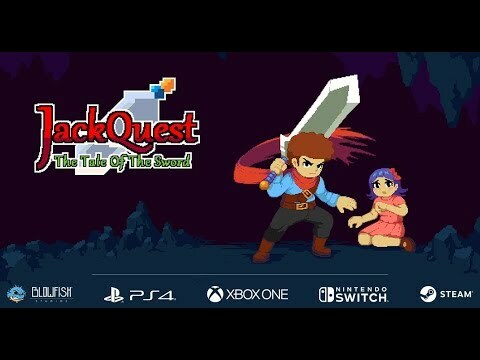 JackQuest: Tale of the Sword was released on PC, PS4, Switch and Xbox One 88d ago in the US and the UK. Notify me when JackQuest: Tale of the Sword is available.